We'll be liveblogging throughout the weekend from The Texas Tribune Festival's race and immigration track — which includes panels on cartel violence in Mexico and the relationship between illegal immigration and criminal justice. 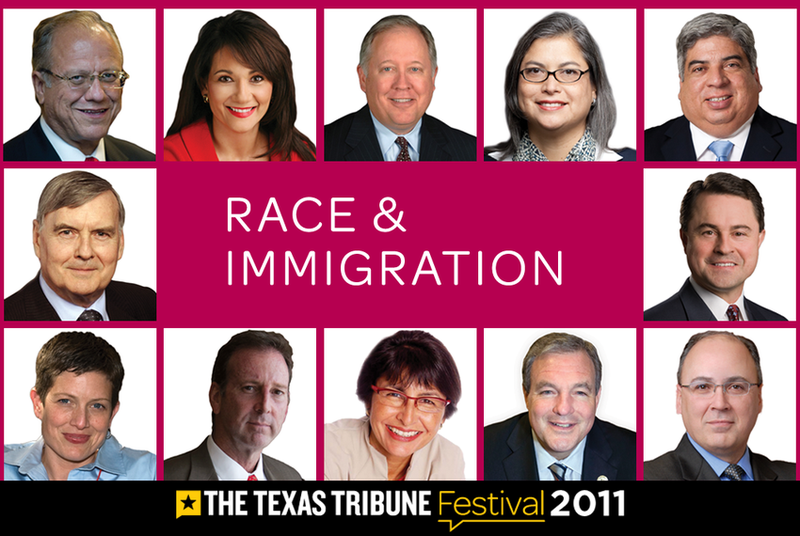 We'll be liveblogging throughout the weekend from The Texas Tribune Festival's race and immigration track — which includes panels on cross-border cartel violence, interdependence between the U.S. and Mexico, the relationship between illegal immigration and criminal justice, and the economics of immigration reform. Featured speakers include U.S. Reps. Henry Cuellar, Silvestre Reyes, Michael McCaul and Blake Farenthold; former U.S. Ambassador to Mexico Tony Garza; and former U.S. Census Bureau Director Steve Murdock. Follow us here for updates from the University of Texas campus. We’re just minutes away from our first panel on race & immigration — Criminal Justice and Illegal Immigration: How Much is Too Much? Ms Grissom leads off with a question about whether states should take over immigration from the feds. Asks Cuellar what the situation is in Laredo. Cuellar: I personally do not believe in amnesty. You have to have a legal guest-worker program. The figures don’t match the rhetoric, with all due respect. Farenthold: The situation on the border has changed. It used to be that folks coming across the border were here to work. Now, the border is being exploited by drug cartels and others who mean ill to this country. It’s not so much economic refugees crossing the border. It’s drug mules and narco-terrorists. Foster rejects claims that most illegal immigrants are criminals. Stands by his claim that they are coming to work, and as the Obama administration has claimed, says the border is more secure than it has ever been. Says he was in San Diego recently and the biggest concern there was that Border Patrol agents there were bored. Cuellar: "I am a big supporter of Secure Communities." The program was intended to weed out criminal aliens, but has come under fire for targeting non-criminal immigrants and separating families. Foster on roles of the states in immigration enforcement: Says states’ outcry on “open border” is a mirage and driven more by groups like FAIR, Center for Immigration Studies, which use scare tactics. Graybill on federal/state enforcement: Says frustration is obvious but to call it frustration only ignores reality. Cites the City of Farmers Branch as an example. The city has been fighting the courts since 2006 after enacting local immigration laws. Cites a speech by Rep. Anchia, D-Dallas, who told a graduating class that it “behooves them to be bilingual.” Says that’s when it started. “We need to call out racism and xenophobia when we see it.” Crowd applauds. Farenthold: Farmers Branch is one extreme and sanctuary cities is the other. You need to have something in the middle. Farenthold: “Local officers should be empowered to enforce whatever laws they choose.” Says bank robbery is a federal offense but that shouldn’t stop a “beat cop” from stopping that crime . Foster says not paying taxes is also a federal crime. Wonders if a beat cop should fight that, too. Farenthold stands firm, however, and says the officer should enforce what laws he or she chooses. Evan Smith and Tony Garza begin their discussion. Evan asks why do Mexico and the U.S. need one another. Garza says Mexico is profoundly affecting our demographics, nationally and statewide, more than any other nation in the world. "It's hard not to look and Mexico and say, 'We better get this thing right.'" Garza says there's a lot of misunderstanding in the U.S. about what's going on in Mexico aside from the violence. If you look at Mexico and benchmark against the rest of South America, they're about middle of the path in terms of violence. "You can't paint with too broad a brush," Garza says. Mexico, he says, is concerned and frustrated about U.S. consumption of drugs and inability to stem flow of guns south. There's still "awareness" in some circles about the degree to which the U.S. would be involved with Mexico on security issues. "It's a different country with a different history when it comes to the United States," he says. Garza says Mexico after 9-11 felt more vulnerable to terrorism because of its proximity and relationship with the U.S.
"All of the sudden the climate started changing in terms of cooperation," he says, adding that base allowed the countries to work more closely to share information about the ongoing drug war. "In that respect that relationship is very healthy," he says. Evan asks why there's tension about the drug war between the two countries. Garza says the U.S. sends messages about Mexico being a failed state has been frustrating for that country. 75-80 percent of the violence is in three or four communities, and up to 80-85 percent of that is drug-on-drug. Garza says you can feel very safe in the city where he lives, Mexico City. By and large, Garza says, it's very safe in Mayan Riviera. The violence, he says, is not as widespread as some perceive it to be. "There are some spots I would definitely stay away from" in the country, especially Mexican border communities. But on the U.S. side of the border, he says, it's still safe. "Quite frankly, I feel very very safe in El Paso, McAllen, San Diego," he says, referring to claims about spillover violence. "Those are very safe communities." Evan asks about the political alignment of President Obama and President Calderon. "Our economies have become more converged," Garza says. What the U.S. has to do, he says, is see Mexico as a ally, instead of as a set of problems. For the ambassador to Mexico, Garza says, a big challenge is just staying on the radar of the president's administration. He says the president doesn't want to hear from the ambassador during an election cycle. His advice to the current ambassador: be like a duck on the water, churning those legs and working below the surface, but calm above it. "We ought to think of immigration reform as something we're doing for ourselves because it's in our best interests," Garza says. "It's just good for us. We're not doing it for anybody else." He says the issue has always been on President Calderon's radar along with the treatment of Mexican's abroad. My sense is that Gov. Perry has done a good job putting down markers where they need to be put down on in-state tuition and the wall, Garza says. "I'd like to see a better tone," he says, adding he's not so naive to believe that political elections are going to generate that kind of tone. Evan asks if the political environment in this country will allow constructive debate and reform of immigration. Garza says others in the world have been surprised and disappointed at the U.S. inability to deal with immigration. "This ditch isn't deep enough, ... apparently we're not quite there yet," he says. Evan asks what the Garza immigration solution would look like. Garza says he's the grandson of Mexican immigrants. He says he wants "a policy that allows people to become part of this great American dream experience that we have." The language that we use to talk about immigration, he says, needs to change. "Any characterization of anything like an amnesty was like a death knell." He says you need an aggressive guest worker program and work from there. "I don't think you can send everybody back," he says. Garza says he never would have imagined that the debate about the border fence would have become as polemic as it was, because there have always been physical obstacles along the border. "I didn't see that explosion coming," he says. His concern was less with the imagery of the fence than concerns about its effectiveness. Security should be based on coordinated response and intelligence with Mexico, he says. "That's just not the best way to secure our country," Garza says. The Mexican presidential race, he says, is going to be interesting and that many believe that it is a center-left country. But questions remain about whether the center-left has enough organization to win the popular vote. Evan asks which Mexican presidential candidate would be best for the U.S. strategically. The institutionalization of the relationship between the U.S. and Mexico, Garza says, means that it will likely maintain the status quo. "We make to much of that first picture" of the two presidents together, he says. "We make too much of the superficial," he says. The interests of the two countries are aligned, and he says that's not likely to change. What's the possibility of Mexico providing a greater percentage of oil to the U.S.? Garza: Their production has been waning for years now. "It's way down," he says. The likelihood them opening up for more investment in production is slim, he says. Audience question: How can successful Hispanic American Republicans like Garza have an impact on the discussion and debate about immigration and border security to curb the of rhetoric and talking points of politicians. Garza: "Why the heck" should Latinos bear the burden alone when everyone benefits from it, he asks. "All of us as country, whether its business — just us as a civil society black, brown, white, whatever" ought to see the benefits of immigration reform and a more orderly system, he says. Garza says he'd like to think we're moving from the emotional to the rational on the immigration debate. "Real leadership anticipates things," he says, and our political leaders in the 90s did not. Audience question: Do you think policies like the border fence and voter ID hurts relationship between the U.S. and Mexico? Garza says they're two different issues. "Nobody felt too good about it," regarding the wall. Voter ID, he says, doesn't resonate in Mexico. "I don't think that's going to happen, any broad scale of legalization of drugs in the United States," Garza says in response to audience commentary about the U.S. market for narcotics propping up the drug war in Mexico. "There's still a lot work to be done in Mexico," he says. Legalization is not a panacea he says. He says there will be black markets for other drugs with potentially more violent crimes. Mexico needs to build stronger institutions to match the crime, he says. Returning from the lunch break, we're preparing to hear from Alejandro Junco de la Vega, president and chief executive officer of the Mexican news media company Grupo Reforma and publisher of many of Mexico's leading newspapers, including Reforma, El Norte and Mural. Junco de la Vega begins with a discussion of musical chairs. In the end only one child wins, and all the others lose. He does not see any hope in going on playing this particular game. It will end in disappointment for almost everyone. What are we to conclude about the unrest in societies around the world, he asks. "Should we be considering what might happen when almost no one has a chair?" he says. He says in Veracruz 49 bodies will be buried today. "My view of the world is colored by the dreadful things that are happening in my country," he says. But no how uncomfortable it is, he says, the truth must be spoken, he says. Junco de la Vega says he has crossed the U.S.-Mexico border countless times and received a warm welcome. "My experience is not the experience of many of my countrymen," he says. He reads from John F. Kennedy's proposal for the Alliance for Progress. "He spoke with a realism that was well founded," he says. But now the situation of his country, he says breaks his heart. He begins a slideshow with a discussion of problems that immigration pose at the street-level in five areas: education, rule of law, medical care, natural resources, law enforcement. Education in Mexico he says is unaccountable and 87 percent of students perform poorly in school. Teachers get automatic tenure and salary tactics include the use of violence. There are no parent-teacher associations, Junco de la Vega says. Students are automatically admitted to university after high school. Although South Korea invests less than Mexico in education, their students perform better, he says. Slide title: Mexico's education system gets an "F". Parents take education into their own hands when teachers get caught up in union violence and fights, he says. On to discussion of the rule of law. Defendants mostly are forced to prove their innocence, and prosecutors are immune from accountability, says Junco de la Vega. He says 42 percent of inmates are awaiting trial. 80 percent, he says, never see a judge but only a courthouse clerks. Public defenders lose 90 percent of their cases. Only 1 in every 100 criminals is ever punished, the slide says. Judges, he says, are not held accountable either. Public officials rarely pay fines and have their records cleared with bribes. Denouncing crime can result in death. When it comes to medical care Junco de la Vega says there is no competition and poor service. "Scalpels often harm rather than heal," a slide says. Only 19 percent of Mexican patients have access to medical coverage, he says. Public health workers get three months of vacation each year. Some communities have no access to a physician on the weekends. One woman, he says, got an appointment after she had already died. Natural resources are also a source of corruption, Junco de la Vega says. Finding oil and gas on your land is a curse, not a blessing. Half of Mexico's land does not have a single undisputed owner, he says. Crop yields and productivity are low, and Mexico imports half of its gasoline. The son of a man who denounced illegal logging was killed. Law enforcement, he says, must choose plata or plomo - silver or lead. Prisons are a source of crime. Police work for criminals. Prison escapes happen often. One inmate collected $32,000 from prison. Police returned a kidnap victim who escaped back to his captors. Only one-third of police get review and evaluation. In 10 month 305 inmates escaped in the border state of Tamaulipas. In Russia in 1940 sensor permitted the movie Grapes of Wrath to be shown in their country to show the failings of the capitalist world. They discovered that Russians were impressed that even during the depression a family could afford an automobile. Junco de la Vega says he faces sensors, too, that others tell him his words are bad for business and the economy. Over the past eight months he says three grenades have exploded on the steps of his newsroom. "We believe in our newsrooms," he says. "Our newsrooms are determined not to be a party to more of this." Mexico is caught between the faint glimmer of the American dream and the reality that is their Mexican nightmare. Even if all the guns were stopped at the border, even if all the drug consumption stopped, there's a legacy of dysfunction in Mexico, he says. Nothing short of deep reform. "No simple fix will be a true one," he says. The stream of people into Texas, he says, he knows brings fear. He asks the audience to consider them refugees. "The flood of my countrymen across the border speaks of something much, much deeper. It speaks of a nation profoundly damaged," he says. No longer does the immigrant hold his hand out for money; he holds it up for help, Junco de la Vega says. "Most human beings are not innately bad or lazy or lawless," he says. By any measure the country of Mexico was in better shape when Kennedy was president 50 years ago than it is today, he says. "We are, sad to say, number one at something. Today we hold first place in the OECD extreme poverty index," he says. For every one immigrant under JFK, he says, there are 15 now. "Your neighbor is bleeding ladies and gentleman. What could possibly come next? Without a diagnosis the hemorrhaging will come next," he says. The criminal ecosystem in his country, Junco de la Vega says, must come to an end. Gangs of criminals run free because no one there is to protect from them. "Because our children see that criminals run free at will doing this, they too come to believe that anything the state runs or owns is free for the taking," he says. The light of truth, he says, must be shown on public officials and corruption. "All of this must go, because all of this is our problem," he says. Mexico wants the same thing America wants, he says: peace and prosperity. "We want to put our nation on the right course and become partners with you." "Small changes at the personal level can transform a nation," Junco de la Vega says. A cancer of dysfunction chokes the lungs of Mexico, he says. "What we are in search of ladies and gentlemen, is the beautiful solution," he says, "... the one that was buried with Kennedy." Look beyond the symptom of immigration to the root of the problem, he says. "There is a Mexico behind those images that is not full of peril," he says. We're beginning the final panel of the day: Was the 82nd Legislative Session Good For Hispanics? We're hearing from state Reps. Veronica Gonzales, D-McAllen; Jose Aliseda, R-Beeville; Jessica Farrar, D-Houston; and Dee Margo, R-El Paso. Gonzales is first up to answer the panel question. "I do believe that this session was especially harmful to Hispanics," she says. The cuts and the laws, she says are going to be felt for years to come. Cuts to public educations, higher education, health and human services all disproportionately hurt Hispanics. Voter ID and redistricting were a direct hit on Hispanics, she says. Rep. Aliseda says the budget shortfalls forced the state government to reduce the size and scope of government, which means Hispanics get to keep more of their money. "I think that's a good thing," he says. He says 68 percent of Hispanics supported voter ID legislation. "We need to have safeguards in our electoral system so that we have confidence in our electoral outcomes," he says. Rep. Farrar says the current budget did not pay for public education growth, and that is crippling our economic future. Our tax system has a structural problem built into it, and future budgets, she says, will be even worse. "In the very near future we're going to be spending more money not just on education but on health care," she says. Funding cuts to universities were not wise, she says, and those will affect us right away. "If we want companies to come to Texas, they come to where there is an educated workforce," she says. Rep. Margo says nothing in the budget was done to "zing" Hispanics. "We did the best we could," he says. For the first time 25 years, statewide property values went down, the margins tax didn't produce what was expected, there were no federal stimulus dollars and a lousy economy, Margo says. "We funded 170,000 new students. Is that enough? No," he says, reiterating that legislators did the best they could with the hand they were dealt. "You pay now or you pay later," Rep. Gonzales says. She asks whether we're spending enough on public education to get students ready for college. Do we spend enough on preventive care to prevent people from landing in the emergency rooms. "You can't just say we're going to tighten our belts and everybody's going to suffer the same," she says, "because everybody is not going to suffer the same." It's about priorities, she says, and Latinos are the fastest growing demographic so they need to stand up. Rep. Farrar says Hispanics are a diverse group. But there is a common belief that education brings opportunity. "For us as Democrats in the coming election it will be much easier to show how these cuts are affecting those opportunities to get ahead," she says. Legislators, she says, have only dealt with public education funding in response to lawsuits by a Hispanic school district. But people, she says, better understand the problem when they see teachers cut from classrooms and real-life impacts of the cuts. "For us as Democrats, it's easier for us to paint a picture of who's for ya, and who ain't for ya," Farrar says. Rep. Aliseda says 50 years of the Great Society has resulted in rampant poverty and illegitimate children. "They're worse off," he says of Hispanics. He agrees that education is the key to making it in this country, but you don't have to rely on the government. Citing his sons use of the GI Bill, he says, he doesn't understand the reliance on the government. "There is no correlation between spending and a better education," he says. "Show me the correlation." Government mandates do not produce better results, he says. Margo says the Rainy Day Fund can't be used anymore. He says the Rainy Day Fund is committed because of the "Solomon choices" that no one was happy with. "It's committed ladies and gentlemen, it's spent," he says. He reiterates that the legislators did the best job they could. "Education is critical," he says. He went to Canutillo Independent School District this weekend to work on a dropout prevention program. "But we've got to make Solomon choices." Taxes across the board, he says, would not have done any good but would have been far more harmful. Rep. Gonzales says the results of Texas not spending on education are low scores. "The proof is in the pudding," she says. Politics, rather than doing what's right, drives the debate, she says. She says she was one of the first in her family to go to college. "I want to see that happen for other students," she says. Gaming to bring in revenue, she says, was not on the table for political reasons. Aliseda says the people on the bus to go to Vegas to gamble are the ones who can't afford it. "Gaming would be a tax on the poor," Aliseda says. Gonzales says: "Well, Jose, I'm glad you're here to be the moral judgment for all of us." Margo says something is out of whack in education when spending continues to increase but scores do not. When things aren't going well, he says, people are forced to re-examine and make changes. Farrar says parents are calling her upset because reading programs are being to cut. "We've really got to address tax policy in this state," she says. But addressing the tax problem, she says, was sacrificed because of the political agendas of legislators and Gov. Perry. Margo says there were some good things legislators did, but he agrees Texas needs to re-examine the margins tax, which isn't bringing in the revenue predicted. "We do need to address it but we weren't going to be able to address it given length time we had and what we were dealing with," he says. Aliseda asks how the sales tax is regressive. Farrar says because everyone pays the same rate, regardless of their income. "That's the way it should be," Aliseda says. Gonzales says parents in her district are complaining about their kids classrooms being crowded. Aliseda says, "When I grew up we had 4o to 50 kids in my classrooms." "And you probably walked through the snow to get there," Gonzales retorts. It's getting a little snippy in here. Now we're onto a *less controversial* topic, redistricting. The two Democrats on the panel say they agreed with the DOJ decision on the map drawing. Aliseda says it was a good map. "I personally think with respect to my district I was satisfied with the way it was drawn," he says. Gonzales: "They did the best they could to keep as many seats as the could keep regardless of the voting rights act," she says. She was left with about 2 percent of her original district, she says. There was no need to changes the lines in her district, she says. They could have just created a new seat. "I think the Justice Department is very justified," she says. Margo joke about redistricting: "With voter ID, I can't expand into New Mexico anymore." Aliseda explaining what drives redistricting: "Incumbent protection." It's not racial gerrymandering, he says. Gonzales says traditionally Latinos and Blacks tend to vote as a Democratic block. So, when districts are drawn to lean Republican, the impact is to turn it into a non-minority district. "That's the kind of thing that the Justice Department is looking at," she says. "The impact that you're going to have is to dilute the voting strength." Aliseda says the reason schools don't succeed is because of state and federal mandates, like classroom size and standardized tests. He says he went to school in Illinois. Aliseda says as a prosecutor in Beeville, he prosecuted cases of voter fraud. He supported voter ID because people expect to show ID for things as mundane as renting movies, and they don't have confidence in a system where they're not required to show an ID. "The reason I supported the voter ID bill was because the people expected it, they wanted it," he says. Farrar says that you don't have a constitutional right to rent a movie, but you have a constitutional right to vote. Audience member says he's going to school on the GI Bill, and he considers it a government benefit which he is "hugely thankful for." "It is an added government investment in my education," he says. Aliseda says it's a benefit in return for his service in the military. Aliseda says he doesn't think we pay our teachers too little. Groans throughout the audience. "I know lawyers making less than teachers," he says. Margo talks about state Rep. Joe Pickett, a Democrat from El Paso, who was condemned by the local party for voting for the voter ID bill. But he says there was a public backlash. "Its a sacrosanct right to vote," he says. He says his kids were educated in public schools. Education is not a partisan issue, he says. "I'm a believer in education. I'm a believer that it drives the economy." Asked about what issues will be important to Hispanics in the next session, all agree on education. Margo compliments Farrar for fulfilling her role as head of the Democratic Party in the House after she talks about her hope that Democrats will do better in the coming election cycle, which will affect the next legislative session. Margo says he is worried about the growing cost of Medicaid. And the day finishes up with a note from Margo that all legislators, regardless of party, are trying to do what they think is best for the state with the resources they have available to them. Goodmorning. Starting off the panel with Stratfor's Fred Burton, Laredo Mayor Raul Salinas and El Paso County Judge Veronica Escobar to discuss the reality of violence in Mexico. Burton tells us that things are bad in Mexico, but the country is not on the verge of collapse. From a trending issue, what's worrisome to him, he says is the connections between organized gangs and street gangs in the U.S.
Salinas agrees that Mexico is not on the brink of collapse. "We have to stop the flow of weapons going south," he says. They go for one reason, to harm people. Cars and cash headed south serve the same purpose. "People are concerned about spillover violence," he says, but in Laredo there have been only six murders and statistics in U.S. border cities show that they are safe. Spillover, he says, is a bunch of "baloney." "It really frustrates me because we're trying to bring business to the border," he says. Salinas questions the appetite for drugs in the U.S.
Escobar says in many ways binational border communities are very interdependent. "It's really challenging to separate emotionally from what's happening a stone's throw away from you," she says. Americans' insatiable appetite for drugs, she says, contributes to the violence. Border policy, she says, is a really broad policy conversation that includes immigration, drugs, security. And despite all the talk, she says, there has been no additional investment in the border ports. The focus has been myopically on violence and security. Escobar says the challenge is having a candid conversation about all of the issues. Traffic to cross the border and share with family members south of the Rio Grande, she says, has pretty much come to a screeching halt. When politicians come to the border to discuss the violence and ignore the other issues, she says, it doesn't help the conversation. "You're creating walls that are monuments really in my opinion to hatred and monuments to failed policy," she says. Meanwhile they refuse to deal with immigration. Absolutely, there are Mexican prison gang members in the United States, but she says that has long been the case. Fred Burton says that there is overlap between Mexican military forces that force gang members back into the United States. Salinas says, "You don't put a wall between friends and neighbors." What Laredo needs, he says, is a fusion center to gather intelligence. Aguilar asks just how infiltrated Laredo is. "Is there activity, yes there is," he says. "That's why it's important for us to have communication." The community, he says, must get involved in reporting to police and investigators. Children on both sides of the border, he says, are vulnerable to the drug gangs and cartels. Aguilar to Burton - How infiltrated is the rest of the U.S.? Burton says communities like Atlanta that weren't before affected are now being used by the drug cartels for money. "Cities such as Atlanta and Los Angeles have pretty much fallen to the control of the criminal cartel networks," he says. This is just not a Mexico-U.S. problem, though, he says it involves all of Central and Latin American. Aguilar asks about a more overt military presence by the U.S. in Mexico. Burton says he doesn't see that happening in the foreseeable future. "The simply do not want U.S. boots on the ground to go after the Chapos over the world," he says. Escobar says it would break her heart to see U.S. troops in Juarez. She says the U.S. has a role in solving the problem, but the solution needs to be policy driven. About 85 percent of immigrants, she says, are non-criminal. Immigration reform is needed to focus on the 15 percent of immigrants who are criminals. And we need smarter more efficient ports. "There are smarter ways to do it," she says, than to send troops South. Those kinds of statements, she says, get us further and further from a solution. Salinas says Americans must be very careful in dealing with Mexico and give our help when it's asked for. "That's what you really have to," he says, "work together." Aguilar asks if one can feel safe anywhere in Mexico. Burton says there is no state in Mexico that is not touched by the cartel violence. "Texas is ground zero," he says. "We're at the tip of the spear." Because of the location on the border and the lucrative gateways into the United States, he says, the border is more dangerous. Escobar says it's been about three years since she has visited Mexico. "I do feel like you could be in the wrong place in the wrong time, and it is an absolute tragedy," she says. Salinas says he has been to Mexico recently. "Do you take precautions, of course you do," he says. Mexico City, he says, is one of the safest cities in that country. "You have to take certain precautions and maintain a low profile," he says. Burton says there are sections of our own country that are just as bad in terms of street crime. The difference, Escobar says, if you get robbed in Washington D.C., you can trust law enforcement to intervene, but not so in Mexico. Burton says the corruption of police doesn't stop at the border, either. "We haven't been very good at taking ownership ourselves of our own problems on our side of the border," he says. Salinas says corruption affects everyone. "It's a worldwide phenomenon," he says. "The root problem that we have is our addiction to the drugs," she says. The U.S., she says, has to acknowledge the war on drugs in a failure. "We need to talk about drug policy," she says. "We need to talk about better ports." There doesn't need to be a trade off of trade for increased drug security at the ports. "We should be leading the way around the globe having better technology," she says. Politicians, she says, are evading the real policy issues, she says. They are debating on a national scale immigration but saying the border must be secure first without defining what a secure border is. Salinas says we can't confuse legitimate commerce and trade with drug smuggling. "We're investing in the wrong places," he says. "Lets be smart about how we're detecting those drugs that come across." He says Americans need to wake up to the drug problem. "We've got to get our act together," he says. "If you look at sheer volume of politicians that have been executed in Mexico that's another frightening issue," he says. When there's less violence there's more control by a cartel. Less violence is a good thing from a political perspective, but it also raises questions about their involvement with the cartels. When there's less violence, Escobar says, that means the U.S. can go back to being in denial about the problem. Salinas says regardless of which political party is in charge, there's a mood of readiness for change in Mexico. But also regardless of which party is in charge, he says, there needs to be more cooperation between the U.S. and Mexico. Audience question: To what extent are cartels in bed with the corporate entities from the U.S. that do business in Mexico. Burton says there's not a day that goes by when multinational corporations don't ask about the affect of violence in Mexico. "There is that ramification to the business community," he says. The cost of doing business there is increasing because of the cost of security. He says corporations don't want to know if their employees in Mexico are paying protection money because it brings up ramifications under U.S. law. Escobar says she has not heard of the maquiladora industry being involved with cartels. "There's always that propensity," Salinas says. Audience question: Is legalization of marijuana a partial solution? Salinas says as a former law enforcement officer says, "I haven't seen anybody who says, 'I use marijuana, and I'm a winner,'" he says. He has a problem with it because of the problems it creates. Burton says as a former police officer he is "old school, too," and doesn't believe in legalization. He says cartels look to other crimes to bring in money when drugs aren't bringing it in. "I think we need to talk about it," Escobar says. But she says it's treacherous territory in this country to talk about legalization and meanwhile there's too little spent on drug prevention and treatment. "In this country we don't have enough of a focus on treatment, rehabilitation and getting help to people who need help," she says. Audience Question: Won't there just be another crime if drug sales are legalized? Burton says if drugs are legalized, the nimble cartels will just switch to some other crime like kidnapping or money laundering. "When your money dries up then you're going to have alternatives," he says. Audience Question: So are you saying there's just no good solution? Escobar says you can mitigate not eliminate but in the U.S. the problems get worse because we refuse to talk about mitigation in a reasonable way. Audience Question: Seems like there's a never-ending circle of Mexico-U.S. problems, is there another model to look at in another country we could use? Salinas brings up the Colombian model. He says the Colombianization of Mexico is happening now. Burton says the trip wires that were crossed in Colombia involved plots to attack U.S. officials and then mobilized Washington to assist. Cartels in Mexico, he says, have pushed the envelope but haven't crossed that threshold. "I think that there's some brilliance in their simplicity," he says. Getting stared with the next panel, The Economics of Immigration Reform with Ag. Commissioner Todd Staples, Sylvia Acevedo, the CEO of Communicard, LLC, a bilingual services provider for businesses, state Rep. Aaron Peña, R-Edinburg, and Eddie Aldrete, the senior vice president of IBC Bank. Staples asks if all agree the immigration system is broken and asks if it needs to be fixed to satiate the growing demand for workers. Panel agrees. Acevedo says not being able to think about those things clearly is the biggest challenge. Peña says it’s a lost opportunity to not address system. “Mexicans are very much like ourselves, They are people of faith and they have strong family bonds.” In a time when we are competing globally, he says it’s Mexican immigrants are a valuable asset. Staples says current visa system is not needs based but data based (visa caps). He says, however, that the mindset most have is that jobs for Americans must come first. Aldrete says the issue is akin to a pipe breaking in kitchen. “Do we send in people with more mops or do we fix the pipe?” Says the current trend when discussing immigration is to mention “boots on the ground first.” If you don’t understand what you need and who you need, you are not going to fix the problem, he says. “We are also a nation of laws,” says Staples. Says it’s not realistic to not discuss border safety as a part of the immigration-reform solution. Acevedo agrees, but says if the concentration is on border security only, the country is missing out on the opportunity to meet its labor needs. Ramsey asks how policy makers address the issues. Staples: “When we talk in terms of comprehensive immigration reform, it signals to many Americans we are going to give up.” Says one thing that always derails discussion is the “pathway to citizenship.” He says that if people want to live the American dream they should be able to but, he also says if people want to come to the US and become citizens they should apply in their home country, first. Peña says the discussion always leads to labels of racism, which he says is disingenuous. Aldrete says a bulk of the country does not get it. In Canada they fly jumbo planes to Mexico to recruit workers to labor for six months, he says. Advocates for at least a discussion on something similar here. “They have a workforce. It works well for Canada and it works well for Mexico,” he says. Staples says people who are unemployed are listening to the discussion and wondering why there is talk about a shortage of workers. Says the problem is that the unemployed are not relocating to where the jobs are. Acevedo says it isn’t true that there is an unending supply of labor from Mexico. Asks if we are ready to accept workers from countries like, for example, Pakistan. Says that will open up another discussion about race and security. “When you look at things you have to look at global labor mobility,” she says. Peña on immigrants here already: “We have to ID who they are and determine if they have broken any laws. Says nothing has been delivered by Obama as far as immigration issues. Acevedo says it is frustrating that issues of border security and immigration always get conflated. Says we must take in to account how that rhetoric harms America’s ability to remain in a positive light around the rest of the globe, especially when dealing with the issue of foreign labor. We're about to start the next Race and Immigration panel: Is Our Border Secure? The panelists are Chad Foster, former mayor of Eagle Pass; U.S. Rep. Michael McCaul, R-Austin; U.S. Rep. Sylvestre Reyes, D-El Paso; and state Sen. Jose Rodriquez, D-El Paso. Scott Braddock, the Austin Bureau Chief for Texas State Networks, is our moderator, and he is about ready to start. Braddock asks what does it mean to have a secure border. Foster, the former Eagle Pass mayor, facetiously asks which border we're talking about: southern, northern, Pacific coast. The audience laughs and Braddock assures him we're focusing on the southern border with Mexico. Rep. Reyes: "I would say that the border has never been more secure than it is today." Rep. McCaul says it is more secure but still not secure enough. He says we can't build a 2,000-mile wall and seal off the border. It really is the technology piece that hasn't been implemented, he says. This isn't about partisan politics, this is about the security of the nation, he says. We need to do more to ensure that the violence convulsing Mexico does not cross the border into Texas. Sen. Rodriquez says he agrees with Rep. McCaul that more can be done with technology. But anecdotally he says his constituents say wonder what border area politicians are talking about when they talk about how dangerous the border is. There was a survey done last year that showed overwhelmingly that people in the area felt secure. Rep. Reyes and former mayor Foster point out that a recent study shows El Paso is the safest city in the nation. Braddock asks Reyes how well armed the cartels are — better than our military or other militaries? Reyes says not better than the U.S. military but probably better armed than some countries in Latin America. He also says the cartels are not "stupid" enough to bring significant violence to Texas because they do not want to provoke a harsh response from the U.S.
McCaul believes the cartels are becoming more violent, more "brazen" in Mexico. No one is going to dispute that they're well-armed or sophisticated, Rodriquez says, but he wants folks here in the U.S. to understand that the serious violence in Mexico isn't spilling over. The cartels aren't "stupid" -- they know what repercussions they would suffer, he says, if they engaged in serious violence in the U.S.
State Sen. Rodriquez says that as a country we need to make a decision about how far the U.S. goes in the militarization of the border. At some point need a balance between use of technology, more customs inspectors and investing in Mexico to create more economic opportunity for young Mexicans. We need to get to a point, he says, where we have a balanced approach to securing the border. Braddock asks McCaul if the border would be more secure if he were a U.S. Senator, a reference to the rumors that McCaul may run for the seat of the retiring Kay Bailey Hutchison. McCaul laughs and says he is going to pass on that question. Question from the audience. A legislative aide from southern Texas says people that he hears from on the street are more concerned about security than the panelists seem to be saying. McCaul says he doesn't want to paint an overly rosy picture. He also notes that the number of OTMs — "other than Mexicans" — coming across the border is on the rise, which concerns him. Rodriquez doesn't know that a rise in OTMs translates into a rise of potential terrorists coming into the U.S.
Braddock: How much is illegal immigration a security threat? Reyes says with the stats we have, a much more dangerous situation as the nine to 12 million already in the country, which is why it's imperative that we have immigration reform. We need to diminish the shadow world, he says. Foster points out that there has never been a terrorist plot that involved the southern border, while there have been threats that have come across the U.S. border with Canada. Rodriguez is disturbed that comprehensive immigration reform continues to be shunted aside in favor of securing the border. Audience member: When do you all as elected officials begin to seriously consider legalizing drugs. Reyes asks which drugs would be legalized? And at what age? It's a mistake to think that legalization will put the cartels out of business. "We will not put them out of business," he says. McCaul: I think legalization is a debate we should have. But he thinks it is a fallacy to say the violence will go away if we legalize marijuana. I think we should look at what causal drug users finance and possibly have a PSA showing people what they enable when they buy drugs. Can you guess which two of our panelists are wearing black cowboy boots? Answer coming up. Audience member wants to know why the question for this panel is border security when the real issue is immigration reform and the demonization of illegal immigrants. She says it is the result of many Americans being afraid of the changing color of the nation. Reyes says we changed the law so that illegal immigration would be criminal rather than a civil matter. Rodriquez says we need to revisit that issue because "that is the issue that has created a lot of the problem for us." McCaul says it is the Mexican economy we need to focus attention on, because people coming across the border into the U.S. want and need jobs, they aren't coming to break the law. Audience member: People come here for economic reasons, not to break the law. The cartels are a separate issue. And she says the reasons the cartels exist is because of the implementation of NAFTA, which she says destroyed jobs in Mexico. Rodriquez says it would make more sense to use our tax dollars to bolster the Mexican economy. And with that our panel is over. Good afternoon. We're starting our last Race and Immigration panel. It features Steve Murdock, former director of the U.S. Census Bureau, former Texas state demographer and currently the Allyn and Gladys Cline Professor of Sociology at Rice University. Murdock starts with a big chart on total population and the percent changes in Texas and the U.S. as a whole from 1850 to 2010. From 2000-2010, Texas had the fifth largest percentage growth. He points out that Texas was the biggest winner in congressional apportionment and will add four new congressional seats. Of the 10 biggest cities in the country, San Antonio lead in growth from 2000-2010, far exceeding in percentage terms the other nine biggest cities. He also disabuses people of the idea that our population growth is the result of immigration. In the United States, the increase in population was 62 percent natural population growth, 38 percent was from immigration, legal and illegal. In Texas, our population growth was 54 percent natural growth, 22 percent was migration from other states and 24 percent was international migration. Of our 40 million foreign-born immigrants in 2010 -- 28 percent (11.2 million) are undocumented or illegal. According to one study, growth of illegal immigration peaked in 2007. Mexico accounts for more than half of the illegal immigrants. Mexico is largest country of legal immigrants too -- 20 percent. As of 2010, about 1 of every 10 persons born in Mexico lives in the United States. U.S. economic woes has contributed to a drop in "in-flow" migration from Mexico. The flow out of the United States into Mexico is also down. Border enforcement has made it more costly and risky to re-enter the United States, they may fear losing their American jobs, economic situation in Mexico is no better. "The other thing that is happening is starting in the 2000s is that fertility is more important than immigration in the growth of our Hispanic population." Total number of illegal immigrants in the United States: 11.2 million -- "not 20 million, not 25 million, but about 11.2 million." He quotes another demographer who says "there is one thing you cannot hide: dying. If there are 25 million they are the healthiest group in the world." Illegal immigrants are about 3.7 percent of the U.S. population and 5.2 percent of the labor force. Of the Texas population, about 6.7 percent is made up of illegal immigrants. Immigrants are disproportionately low-skilled, he says. We do not have enough people in the United States to fill some of these job categories. In Texas, 60 to 80 percent of the newest members of the labor force are foreign born. Now he tackles the question of whether new immigrants aren't assimilating, aren't learning English, for example. Research shows that there isn't a large increase in English spoken at home between first and second generation Hispanic immigrants, far lower increase than non-Hispanic immigrants. However, research has found almost identical high levels of second generation Hispanic immigrants with excellent proficiency in English language skills as non-Hispanic second generation immigrants. In other words, while English may not be the dominant language spoken at home of Hispanic immigrants, they nonetheless possess excellent English language skills. What about the future: flows are down, mostly because of the economy. Stepped up enforcement may be slowing it but not clear. Also in Mexico the fertility rate is down and there are lessening pressure to migrate from Mexico. Hispanic population growth in Texas, 2000 to 2010: 6.7 million to 9.5 million. But less than 25 percent of that is due to illegal immigration, he says. Now he is showing maps of Texas: of 161 of our 252 counties, there was a decline in anglo population growth. In 228 counties there was Hispanic population growth. Among African-Americans, there was growth in 83 counties. In 97 counties, the Asian population grew. Dallas ISD: 95 percent of the school population is non Anglo. Houston ISD: 92 percent of the population is non Anglo. Murdock is making a devastating case that if we do nothing, our household income in Texas will decline significantly through 2040, our labor force will become less skilled, and Texas will be worse off economically. For those who argue that it is important to educate even those here illegally, Murdock's numbers are a powerful persuader. "What does all of this mean? There are a couple of things: It is clear whether we look at Texas or look at the US that the future of both is tied to its minority populations. How well they do is how well Texas and the US will do. " If we do not take into account these demographic trends, he says, we will be much less successful as a state and a nation. Murdock argues that it is in Texas' economic interest to make higher education more available to everyone, including illegal immigrants -- that to make it harder for illegal immigrants to attend college will inevitably damage our economy. In other words, he is praising Gov. Perry's actions in extending in-state college tuition rates to illegal immigrants. It's in our economic self interest, Murdock says, to do this. Murdock has concluded his presentation.